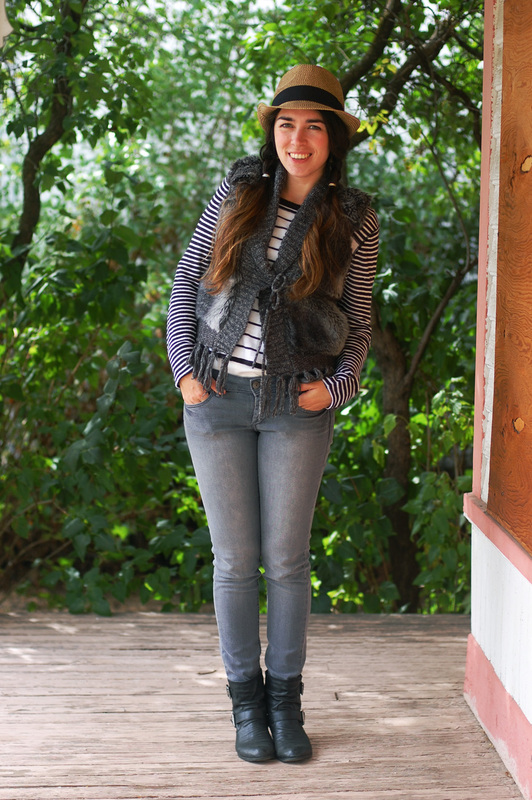 I got the idea for this post from this weeks IFB Style Challenge: Back to Basics. While I was thinking up an outfit I realized that I don’t really own a pair of basic jeans anymore. I love this! Jeans were one of my style ruts back in high school. I had a couple pairs that all looked the same and it rarely made a difference which one in the morning. I still remember my first printed pair of jeans. They were a medium wash, wide flare from Areopostale that had the cutest thin white vertical pinstripes. I wore those jeans to death! Now that my pants drawer has 7 different colors in it I feel like I could wear jeans all the time without worrying about feeling boring. But if that’s not you, I’ve got 3 simple tips below for looking quite stylish in your basics. For me, jeans and a t-shirt are the epitome of a lazy day outfit, or a busy day outfit, or a casual day outfit. Basically anytime I don’t want to put a lot of effort into an outfit. While this is also usually my number one tip for getting dressed any day, it’s especially important when you don’t want to be thinking about your outfit as the day goes on. These jeans are actually jeggings from American Eagle. That mostly just means they are super soft and feel extremely comfortable all day long. I’ve always struggle with accessories so they usually take me a long time to figure out for each outfit. That is not something I want to deal with when I’m trying not to focus on what I’m wearing. For this day, my only thought was “It’s Cold” so I grabbed my favorite cardigan of the moment to keep myself warm while running errands. 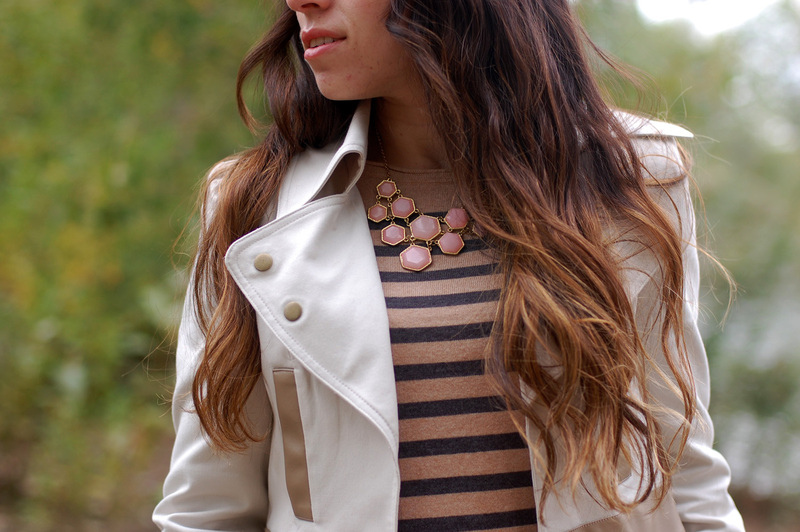 If you’re a person who always has to have some jewelry, just grab your favorite or go-to piece. 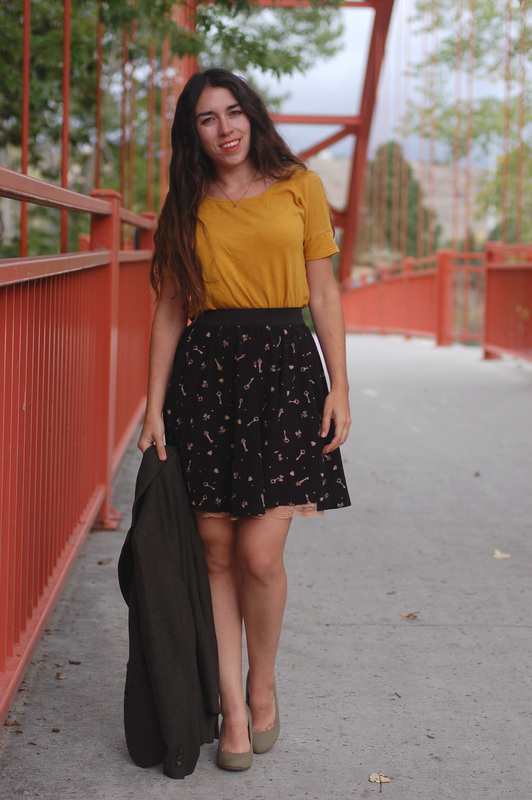 Even if it’s not the perfect match for the outfit, you’ll feel comfortable and confident in it, and that’s all that’s necessary to rock any outfit. On my shoes. As I said earlier, this was a practical outfit for getting things done, so at first glance my beautiful wedge booties (that I absolutely love) kinda violate two of my rules. If you can’t already tell, I’m a bit of a shoe addict and spent some time in college working at DSW. This caused my shoe collection to suddenly explode with a ton of amazing, but mostly impractical, heels. I always feel bad about having all these shoes that rarely get worn, so I tend to take the more comfortable ones out on errand days. I mean, errands are mostly spend driving in-between places anyways. These booties are super comfy because the wedge and the enclosed boot both work to support my foot while its at the weird heel height angle. And I don’t know if you can tell, but they have stellar traction for when winter comes. How do you wear jeans and a t-shirt? What would you consider your basic outfit? I bought this faux fur vest as a joke. I tried it on in stores while I was trying to one up my friend’s hilarious fur vest and thought I looked just ridiculous. But that got me to try it on. Up close, I realized that the faux fur made a really interesting texture. And I constantly suffer from being a weenie about cold, so a vest ( before this I didn’t have any) might actually be helpful. Finally I threw in “Grey’s a versatile color” and walked out of the store with a new piece of clothing that I thought I was just going to wear in jest. 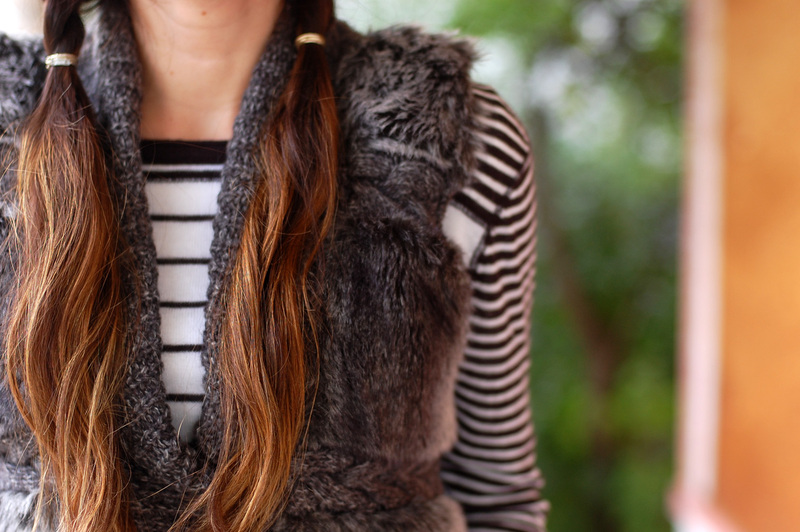 Now that happened a few months ago and now that temperatures are starting to cool down, my thoughts turned back to this silly faux fur vest. It took me three costume changes in the morning but I ended up in an outfit that I felt amazing and only a little bit silly. We spent the short morning before I had to go to work visiting the Idaho Historical Museum‘s 40th annual Museum Comes to Life. Wouldn’t it be fun to wear clothing like this! Certainly along the lines of feeling silly, but if someone handed me the full getup I would be 100% for it. However, I’m not quiet up to the task of creating a masterpiece like this. Have a really awesome Wednesday! I am 100% down with pink pants. As I’m writing this I just happen to also be wearing a pair of pink jeggings that I thrifted this past weekend. These pants were my best deal of the day on my epic work clothes hunt. I found them in the clearance section of JCP for two dollars. Yep, $2!! I was, and am still, so jazzed about finding them and I know it was just meant to be. They reason they were on such clearance is because they are from the summer collection and are meant to be cropped. This just makes me laugh so much because they fit me perfectly full length. For once, a shopping perk for being short. My biggest conundrum when thinking work attire was how to add in my creativity. These trousers hit that nail on its head. The soft pink color is unexpected in the work world and I can’t wait to style these pants through fall and winter. For my first time wearing them I went with a very basic neutral look. The sweater (and the Jacket) I also got on my work shopping spree and it was kinda a splurge, being less than 50% off (but still on sale) but I just love it! I’ve worn it a few times since then and you can’t tell but it has the cutest little button detailing on the shoulder by the neckline. The jacket just makes me feel like a rock star. Don’t you just love pieces like that! My roommate said I need to dress up as Elvis and wear it. Oh yea, and I upgraded my phone. I had the hardest time getting the focus right for these photos, who knows why, so my outtakes folder is filled with a bunch of fuzzy funny photos of me posing with my new yellow tech baby. For me, one the the worst parts of the fall and everything getting colder is the sun. Not itself, but how I can look out the window and see a beautiful green lawn and a bright sunny day, yet find out that it is actually in the 50s. That’s just deceptive! Luckily we’ve had some of our probably last warmer days and I’ve enjoyed sitting in the sun, basking. It’s especially wonderful now that I’m already covered up, so I don’t have to deal with sunscreen. I also don’t over heat so I an just bask forever. I swear I’m a lizard by the way. I love this lace top and didn’t have many chances to wear it this summer. I always felt a little too exposed in the see-through lace and the butterfly back, so it is the perfect piece to bring into my fall layers. This is the perfect flannel shirt that I thrifted last winter. I could wear it all the time, it has the perfect soft, flexible, and fit, and of couse SNAPS! Who doesn’t love snaps. I always feel like a super hero getting undressed. I went on a wonderful thrifting weekend with some of my working girls and hit gold with this exact top in a yellow plaid. It’s in my hamper right now and I cannot wait to start wearing it, constantly. My favorite part of this outfit is by far the open back detail. 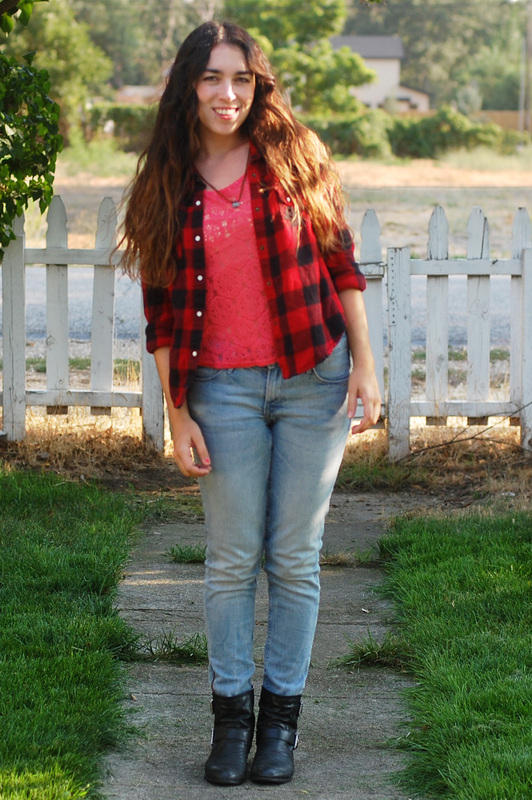 Besides for these pictures, I didn’t actually ever take off my flannel. I loved just knowing that I had a bit of intrigue and surprise under there. No matter how much I’m influenced by others, I love to get dressed just for myself. I really don’t care what people think of my outfit if it makes me happy, and it is such a mood booster to feel like you’re just rockin’ what you’re wearing. Will you still wear your see-through pieces in the colder months? I’m pretty excited to share with you my first attempt at work-style. This was all pulled together from clothing that I just happened to have already in my wardrobe, but I’ve actually worn it once before to my sorority’s founder’s day brunch. 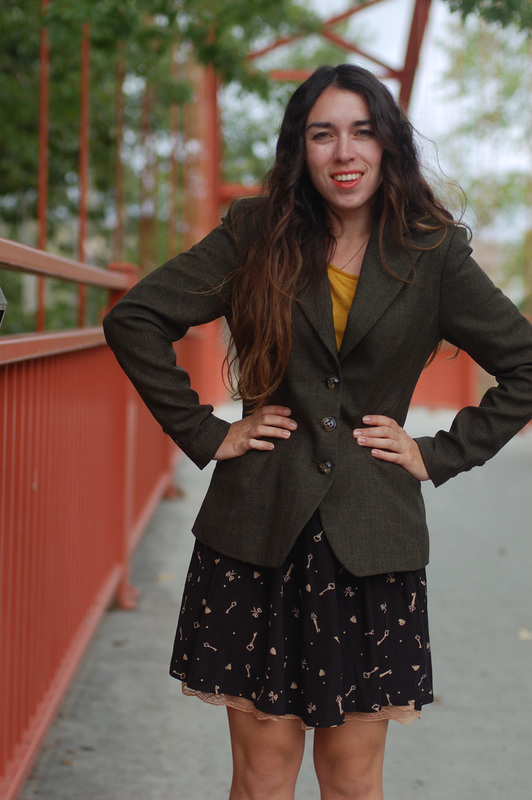 I found this blazer while thrifting and it is such a great quality, It’s a bit of an older fit, but it makes me feel so classic. My ideal way to wear the blazer would be open over skinny jeans, big heels, and a relaxed shirt, but that isn’t very work friendly. I mentioned back in my Drinking Skirt post about how much I loved this Target top, and I barely managed to tuck the crop top into this skirt. I’m not the biggest fan of the wide black band on the skirt, so the couple other times I’ve worn it I’ve tucked it inwards. Before now, I’ve felt that this skirt is a little longer than I would like, so tucking in the band also helped shorten it. In an office environment I figured it would be better to err on the longer side. The skirt turned out to be perfect for sitting at my desk, being productive and such. I’m a little odd but my favorite way to sit in a chair is criss-cross-applesauce. Something about pulling my legs under me just helps straighten me out (Weird, I know). I just suddenly have better posture and overall feel much more energized, at least until I have to move again, then major knee pain. So far I’ve found some difficulties with this sitting position and work clothes, so that makes this flowy skirt pretty much my dream sitting skirt. It got a little too cold while taking these pictures. By the end my fingers felt pretty close to numb. How does your work style change from summer to winter?